It's EARTH DAY in the Valley Arts District and ValleyArts has joined forces with Garden State Kitchen to bring you an afternoon of celebrating! • And tons of fun! For Grades 2 - 5. Fueled by the fire in their own bellies, this workshop is designed for children who want to make work and have the chance to experiment deeply with mixed media on paper. Using a series of prompts, guidance and a range of materials, students will engage in artmaking that prioritizes organic process, individual expression, and the idea of what matters most to them. We will utilize the playful, experimental nature of the artistic process to create a series of pieces based on what we dare to imagine together. The last session will be an Open Gallery for families to see the work of the young artists and to hear what they have to say about it. Third Day Hemp + ValleyArts present a Medicinal Marijuana + CBD Educational Event on Saturday, March 30, 2019 in Orange, NJ. At this event you can Stuff Your Own Hemp Pre-Roll! My goal is to bring Medicinal Marijuana + CBD education to every city in New Jersey + beyond. If you're interested in partnering to bring this event to your town, please email me at info@jlexillc.com. Design your own 2oz gourmet tea blend using organic tea leaves, herbs, botanicals, mushrooms, fruit, and more. Blend teas for beautiful skin, detox, energy, relaxation, or to calm and soothe. You’ll learn the benefits of the ingredients to blend the perfect brew. To request ingredients or more info, contact Celeste at 973-674-7080. Using needle, thread, and felt fabric, learn how to create a colorful flower shaped ornament, which also can be used as a pin cushion, using hand sewing techniques. Supplies included. Ages 9+. Knitting is a great way to unplug and de-stress. Come learn basic stitches and make a scarf or cowl. You can come with your child, with a friend, or on your own, and be guided through casting on and setting up for a scarf or a cowl and get assistance through the process to the finished product. Materials included. In laughter yoga we combine laughter exercises and deep breathing with youthful playfulness and movement to connect, unwind, and ease stress . Dress comfortably. No yoga mats, sense of humor, or flexibility are necessary. Suitable for adults of all ages and abilities. Bring a bottle of water and a blanket to sit on. Creativity is for everyone and everyone is creative! Register now for our spring Creative Community Workshop series for adults, children, and mixed ages. Make a fun and beautiful craft project with artist member and teaching artist Sarah Langsam. Suitable for ages 8+. All supplies included. Cash at the door preferred, credit cards accepted. If you are looking for a unique gift or just a new treasure for yourself, join us at this beading workshop. Instructor May Parker leads a class for kids and adults alike to design and create a beaded bracelet. Perfect for a gift or for yourself. Supplies included. Instructor Juanita Martin leads you through different ways to create a Tree of Life, using semi-precious gemstones, seed beads and enameled wire. The Tree of Life is said to connect all forms of creation and dates back to the concept of the Sacred Tree, found in a variety of the world’s religions, myths and cultures. Here is an opportunity to remind you of your connection to the world and the world’s connection to you. All materials and tools provided. “Mirthful laughter” has been shown to help reduce chronic pain, improve immune response, alleviate depression, and improve cardiovascular health. Wear loose clothing and bring water. No Yoga mats necessary. 20 people max. Led by Joan Castellano, certified Laughter Yoga leader. First come first served. Cash at the door preferred, credit cards accepted. Unfortunately, the weather has forced the cancellation of this event. We hope to host the McClure Twins another time. We will be collecting for for local food pantries in Orange and West Orange - Please bring a donation if you can! Presented by CC Minton and ValleyArts. Fiesta de la cuadra! Venga a un día de diversión familiar con entretenimiento! Come for a day of family fun with entertainment, bouncy house, music, children's crafts, and activities for all. It's a celebration of innovation and vitality in the City of Orange! Location: Main St. in front of Orange Public Library and Cleveland St. in front of Rosa Parks Community School. Dirección: Main St. delante de la Biblioteca Publica de Orange y Cleveland St. delante de Rosa Parks Community School. Presented by ValleyArts, Orange Community Schools, Healthy Orange, Municipality of Orange. Think you know your musical stuff? Join us for a Pub Quiz of Music Trivia and prove it! Come with a team or join one. $10/person - winning team takes half the pot. Sign up 7-7:45pm. Quiz starts at 8pm. Beer, wine, snacks, music, and lots of fun! In partnership with our friends at Brainiac Records. Urban farming provides self sustainability, delicious fresh food, better health, and promote community in your neighborhood - and it isn’t as hard as you might think! Join Bushie and Shujaa as they lead you through the process - from crop selection to planning - and explain the different methods of farming possible in an urban setting. Plus, the first 15 people to RSVP will leave with a container, soil, and something to grow! RSVPs help us plan, but drop ins welcome. Suggested donation to participate is $5, but no one will be turned away. All donations go to our teachers and to fund other workshops. Workshop will take place in the courtyard, through the gates next to the artfullbean café. Join your friends and neighbors at the Knick Knack Neighborhood Flea Market/Rummage Sale! Find something new to you that you just can’t live without. There will be knick knacks, antiques, vintage items from individuals and professional vendors alike. Decor, household items, dish ware, art, furniture, clothing, vinyl records, and more. Don’t miss this chance to browse the treasures that lie right here in your own neighborhood! Nia Fellowship Baptist Church, 174 S. Valley Rd, West Orange. RAIN OR SHINE! If it rains, we will be inside! $15 gets you a dedicated space and a 6ft. table. Register now! Please join us for a special curated tasting session of select olive oils as we celebrate how the legendary olive tree and the oil extracted from its fruits has inspired a harmonic connection to the universe in our every day lives. A unique and unforgettable sensory experience: Olive oil tasting, wine, and Italian delectables included in the price of the ticket. Cost: $25 per person, tickets available at online store. Presentation + original artwork by Ms. Stefania Belli, artist and founder of La Lingua La Vita in Todi, Italy. A limited supply of select olive oil imported for the event will be available for purchase. All profits from this event will contribute to the ongoing educational programs of ValleyArts. 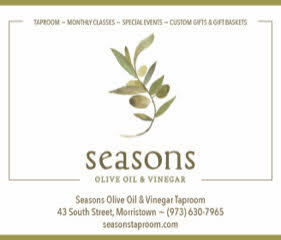 Seasons Olive Oil & Vinegar Taproom, Arturo's Osteria & Pizzeria, Kitchen ala Mode, and The Wine Barrel. The Holidays are coming! Let’s come together as a community for the children this holiday season. Bring your donations of new toys for children of all ages - we will make sure they get into the hands of local children. Toy drive drop-off is Nov. 11 – Dec. 16, 8am – 5pm at ValleyArts, 400 S. Jefferson St., Orange, NJ 07050. $15 gets you a dedicated space and a 6ft. table. Register online.